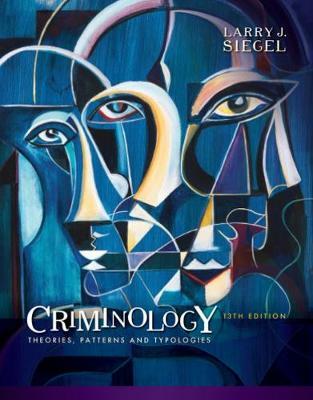 The bestselling text on the market and now in its thirteenth edition, CRIMINOLOGY: THEORIES, PATTERNS, AND TYPOLOGIES, delivers the most comprehensive, in-depth analysis of criminological theory and crime typologies available -- showing you how criminology relates to criminal justice policy. Renowned for his unbiased presentation of theories, issues, and controversies, Dr. Siegel encourages you to weigh the evidence and form your own conclusions. The text includes cutting-edge seminal research, up-to-the-minute policy, hundreds of new references, and new material on the legalization of marijuana, ISIL and terrorism, mass shootings, cybercrime, green crime, and transnational crime. It also maximizes your study efforts through chapter objectives, end-of-chapter reviews, key concepts, concepts summary tables, and newsworthy examples that help you see how what you are learning applies in the real world, thereby equipping you with the tools you need to succeed.